Just by looking at the name “Ecuador” you can guess its location on a map, correct? Ecuador straddles the equatorial line, so one of its attractions is visiting the “Middle of the World” or la Mitad del Mundo. 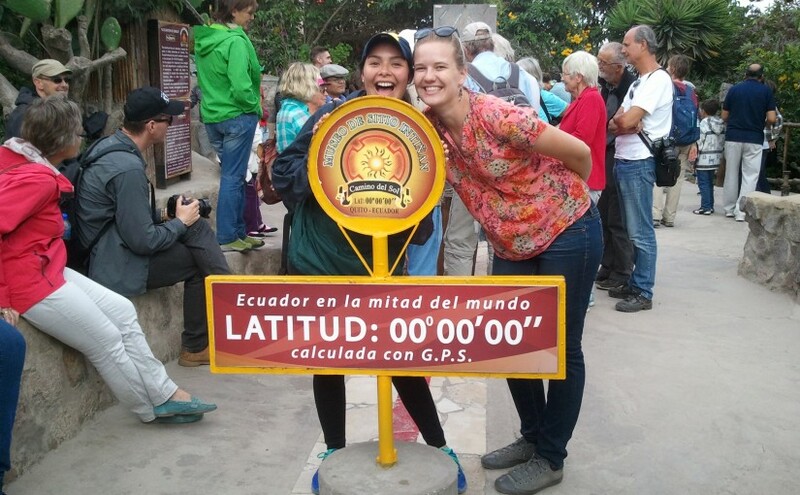 So, mis amigos, I’ve created a list of things you can do if you visit the equator in Ecuador! Cuy (although this photograph was taken in Baños, Ecuador and not la MDM). Try some cuy. There are many locations in and around la MDM where cuy is sold. If you’re wondering, “What is cuy?” let me tell you that it is a delicious meat eaten in Ecuador that tastes like chicken… except it’s guinea pig. You have to try it at least once. I’ll assure you that I was skeptical at first because I know a lot of people own a pet guinea pig. But just so you know, one of my friends here has a pet guinea pig back in the states, but he still tried cuy and loved it! 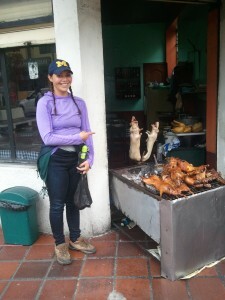 Recommendation: Eat cuy at Restaurante Pueblita located outside of la MDM in a town called Pomasqui. I’ve heard that this is the best cuy place. Visit the Museo Intiñan. This museum will take you through a tour of the animals in the Ecuadorian rainforest, the process of making a shrinking head, the living spaces of a group of indigenous peoples of the rainforest, and many other surprises. You’ll be able to take a picture at the equator standing on both hemispheres! Also, if you ask, you could get the chocolate tour which lets you see the chocolate-making process and you can sample some chocolate bits. Balance an egg on a the head of a nail. This is also done at Intiñan as part of the tour. But the cool part is that if you actually get it to balance, you get a little diploma that states your accomplishment. 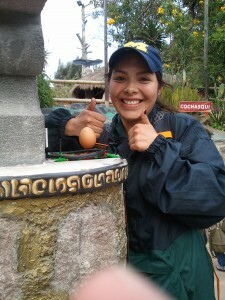 It took me only two tries to balance the egg and feel like an equatorial champion. “Successfully Balanced an Egg” ft. my friend’s thumb. See the UNASUR building. This building is only a few years old and was used earlier this year to hold the UNASUR conference. UNASUR is the Union of South American Nations, and their event hosted the presidents of the South American countries as well as some of the Central American presidents. Outside of the building are the flags of all of the South American nations. Go see the monument at the Middle of the World. I did not have time to see this monument because the area was closing (I took too long at the Intiñan Museum). Inside of the closed area is another museum full of history of Ecuador, more flags, and the giant monument where you can take a picture. See the “actual” Mitad del Mundo. The tourist areas are the ones I’ve mentioned before, but the real MDM (where GPS devices have confirmed is the actual longitude and latitude zero) is on top of a mountain a few kilometers away from the monument and UNASUR building. There is a pole at the top of the mountain that marks the spot for the real MDM. Ask any local and they will be happy to point you to the area. Visit the largest self-sustained volcano valley village. There are taxi rides that will take you to Pululahua to see inside of the volcano. It’s villagers only travel outside to buy some commodities not grown or found within the volcano. However, the villagers grow their own food down there since the land is surprisingly fertile and they receive a ton of humidity from the clouds. My only advice would be to visit this site earlier in the morning when there are no clouds or fog so that you’ll be able to see inside the volcano crater. Another tip: Wear warm clothing since it’ll be colder there. That’s it for the list, mis amigos. But be sure to keep following my blogs to find out more about studying abroad in general and specifically in Ecuador! ¡Hasta luego, amigos! Going Inside of a Volcano?! Sounds crazy, right? Well the truth is that the volcano, while active, only releases small bubbles to the surface of the lake that covers the crater of the volcano. So even though I was “inside” of a volcano, it only felt like I was on the lake! 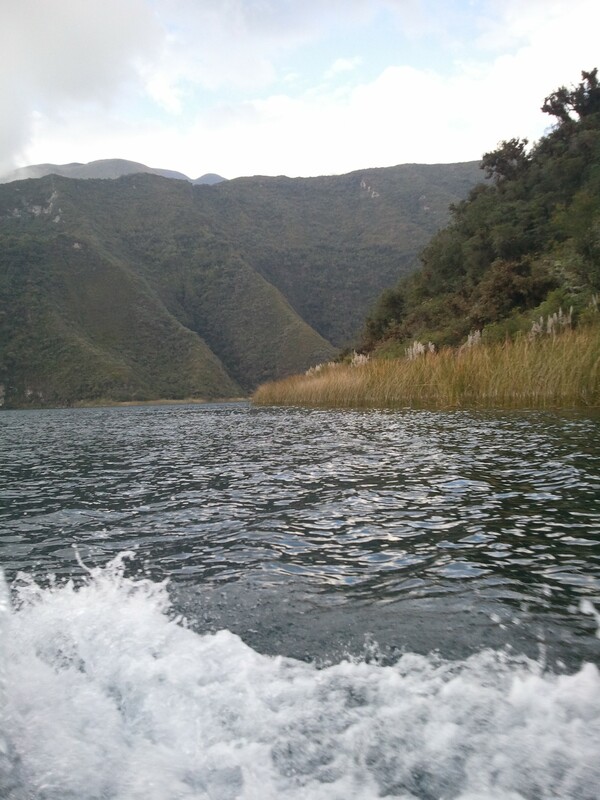 Traveling by boat over Lake Cuicocha. Surrounding us are the large volcanic walls of El Volcán Cotacachi. There are two small islands inside the crater. The exact depth of the lake is unknown because researchers have never reached the bottom. The lake was formed from rains and the melting of the snow on the volcano. There are no fish in the lake because of its toxicity. The ducks and herons that eat from the lake only eat the algae. Wild guinea pigs live on the small islands. 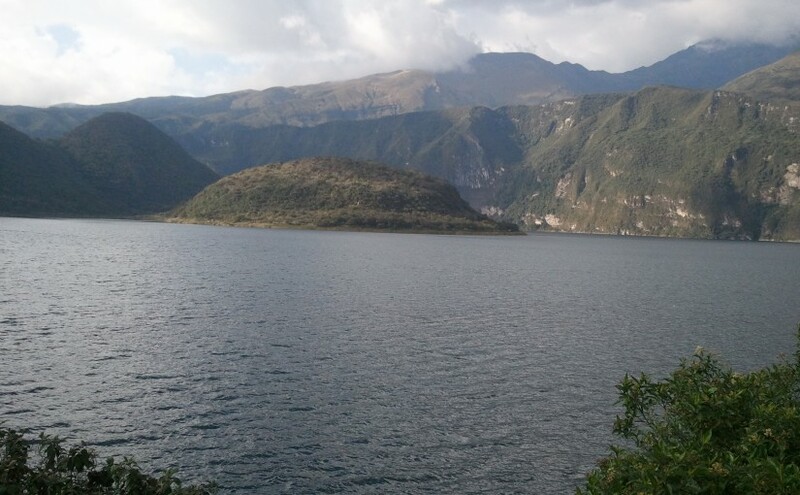 They’re called cuy which inspired the named of the Lago Cuicocha. Other animals that live on the islands include: rabbits, armadillos, deer, and wolves (otherwise known as el zorro andino). There used to be a docile zoo bear roaming the area which was friendly even to tourists. It was hunted down one day when it swam off of the island and into private property. The islands are well-protected and uninhabited by humans after careless man-made fires caused one of the islands to burn. It lost a lot of its vegetation which is now endangered. Since humans are no longer allowed on the islands, there is an abandoned restaurant that sits on one of the island hillsides. It serves as a reminder of the horrific tragedy. Despite it’s beauty, our group only spent a short part of the evening on the lake. Earlier that day, we traveled to San Antonio and Otavalo to explore different marketplaces. In San Antonio, we visited the house of sculptors who have been creating wooden art for generations. They showed us the process of forming the sculpture out of wood, creating sharp details, using painted glass for eyes, and the painting processes that make the final product. I would have liked to buy one of the sculptures because they were amazingly beautiful! But, the pieces were pricey and I would have run out of my spending money for the whole trip… Maybe I’ll return one day when I’m out of college and I actually have money. Next, we visited the famous indigenous market in Otavalo. The colors and crafts were amazing, unfortunately I didn’t take any pictures since it was very crowded and my hands were full with my purchases. This was the first time I ever negotiated prices with a vendor, and it was a fulfilling experience. Although I wanted to buy things for myself, I ended up spending all of the money I took with me on souvenirs for my friends and loved ones. I didn’t finish buying everyone a gift, so I would like to return with some friends one day to get everyone on my souvenir list a small gift. 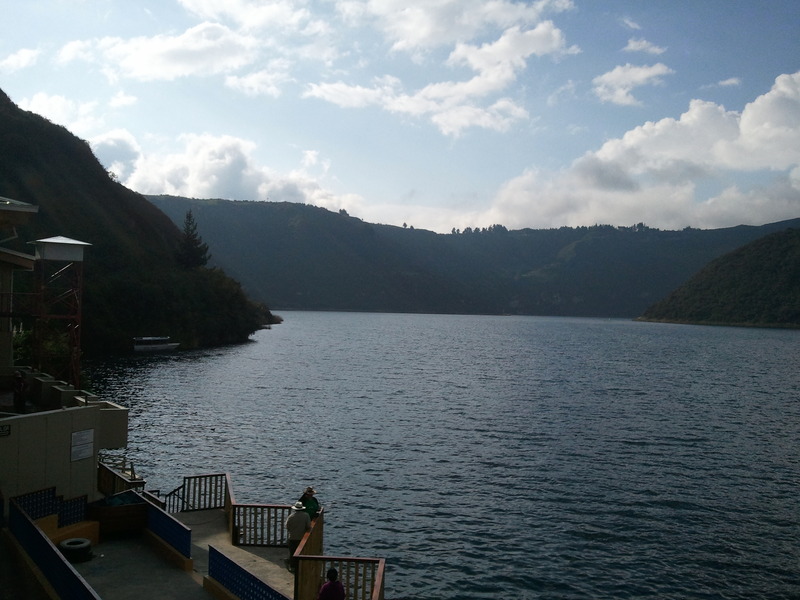 Posted on February 9, 2016 Author Brenda MoraCategories Culture, TravelTags Cotacachi, Cuicocha, Ecuador, lake, volcanoLeave a comment on Going Inside of a Volcano? !